Pinot noir is certainly not unique to Sonoma, at least not in California the way it is unique (in France) to Burgundy (with minor exposure in Alsace next door). But Sonoma does especially well with Pinot Noir, has more acres of PN than any other single County in North America, and supports significant stylistic differences from district to district. Sonoma is also well known for artisan cheeses, which may help illustrate wine variations more obviously. The investment of time we seem to be proposing in this Theme Tour of Sonoma Pinot Noirs is much greater than one could or should attempt to accomplish on a single trip. Don’t torture your sweetheart by dragging him/her along on a hard target investigation to follow our suggested tour exactly. Go the beach one day instead of to a fourth winery. Play Liars Dice in an Italian wine bar. Dip your toes in this pool, and leave swimming for some point down the road when pinot mania truly has got its teeth into you. Leave the pinot envy jokes at home. In this 3-day weekend itinerary, wineries marked in green are open to the public. Wineries marked in red require appointments. Vyd planted by Roche, but impressive architecture and interior design all done by new investors, along with additional planting. Carneros typicité. Tiny personal project, from the winemaker at Kamen, using cool climategrapes from the actual Sonoma Coast. Does she intrude on the terroir? Veteran winemaker who is part owner of a spectacular vineyard at about 1,200 ft elevation overlooking San Pablo Bay. Is he above the wind? Winery sourcing grapes from several prominent growers in southern Sonoma Valley as opposed to Carneros. Last tasting visit, hotel, dinner, and breakfast are all within a block or two of the Sonoma Plaza. New winery making large investment, pioneering cool-climate former dairy district. Enormous market potential if they can make great wine. Wind is an issue. Individual blocks on 650-acre ranch may shine. Husband-wife winemakers source from several places. Good chance to compare Sonoma to Monterey. Good track record. Reasonable prices. Historic winery run by the legend’s daughter Lynn and her accomplished winemaker husband. Rod Bergland likes micro-biological complexity. Super-star winemaker has produced several of best Chardonnays in CA history. Loves PN, and brings unique blend of science / art to the task. Owned by scion (daughter) of famous Torres family from Spain. Once married to Robert Finnigan (top American wine writer). Makes really good wine consistently in a cold region, and at an attractive price. Good rep among up & comers. 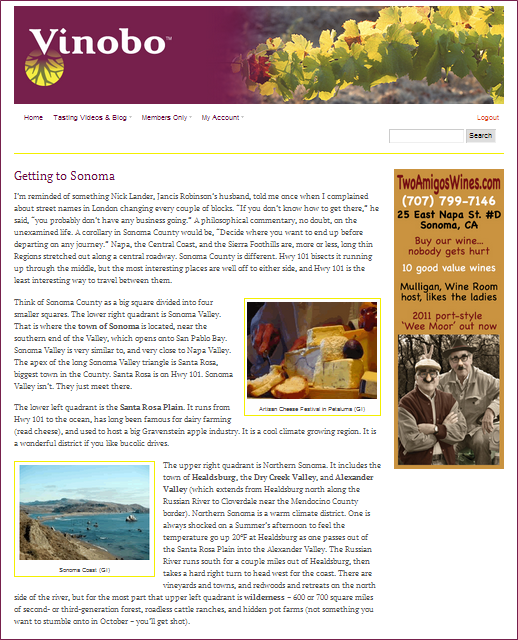 Visit shared Healdsburg Tasting Room. Their PN grapes took Sweepstakes at State Fair three times ~ each with a different brand / winemaker. Now owned by Terlato, same grapes though. Will be tough to get a convenient reservation, but well worth the effort. Be flexible. Spectacular location; really good wines. Difficult terroir to understand: looks at the ocean; yet ripens earlier than the Plain. New AVA with real ocean credentials, although most of the vineyards are on ridge tops high enough to be out of the fog. Expensive grapes to buy. Dinner: RIVER’S END Reserve well ahead for window table. Only a few rooms for overnight. Time the sunset if possible. Whole berry fermentation is considered to give wines a fruitier, brighter smell, and less tannic astringency. It is a variation on a technique called carbonic maceration, which is employed to make Beaujolais Nouveau by fermenting in closed containers which capture CO2. Some Pinot Noirs are fermented with a percentage of whole berries. It is regarded as a very gentle technique, but whether or not stems are included is an important consideration. Cold soak, prior to fermentation, is employed more and more with Pinot Noir. Two or three days on the skins before initiating fermentation is now standard practice. The inventor of cold soak was Burgundian winemaker Henri Jayer. He liked five or six days. He died in 2006. One of Jayer’s most ardent fans was Burgundian consultant Guy Accad, who advocated seven to ten days at 45ºF with a very high dose of SO2 to inhibit any yeast on the skins. Accad is now considered something of an extremist. Different yeasts can be very important. Wadenswill is highly regarded, as is Assmanhausen, for emphasizing fruity aromas. The choice of yeast may also depend on a desire to slow fermentation down, and to maintain lower temperatures for aroma retention. Wild yeast is more commonly chosen for fermentations in Pinot Noir than in other red varieties. Punch down is kind of a basket term used here to encompass all the various techniques for keeping skins submerged in the must (fermenting juice) during fermentation. Because of its relative refinement, Pinot Noir seems to show the effect(s) from these techniques more obviously than do wines like Syrah or Cabernet Sauvignon. Much more rarely will a discussion of seed removal raise its head. Winemakers never bring it up, except amongst themselves. Seeds can be removed from fermenters in a couple creative ways (see délestage description in our ‘punch down’ Glossary entry). The controversy is whether or not removing seeds is a good idea. Advocates say seeds contribute tannins which are measurably more bitter (catechins with gallic acid bonded on) than those from skins or wooden barrels. Others opine wine needs those specific backnotes to have balanced, long lasting flavor. Maceration with stems is a traditional Burgundian technique, particularly in cold, wet years when Pinot Noirs are likely to be thin, light-colored and low on extract. Stem maceration can be accomplished by leaving stems on whole clusters, or by adding stems back to the fermenter after the grapes have passed through the stemmer-crusher. In California stems are not highly regarded. The major reason is that stems in California are usually still green with sap in them when grapes are picked. In Burgundy, the plants are more likely to have stopped growing, and the stems to have lignified (turned brown). The other reason is that California usually enjoys ripe grapes with no need for tannin enhancement. All Pinot Noirs in CA go through MLF. Timing may be different though. In California winemakers like to introduce a commercial MLF culture while the alcohol fermentation is still ongoing. They want to finish MLF (i.e. convert all the malic acid to lactic acid) before Christmas, and to rack the wines off any gros lees so the wines can be put safely into barrels before the Holiday period begins. Because of the low ambient air temperature in Burgundian cellars in November and December it is rare for red Burgundy to finish MLF until the barrels warm up in the Spring. It stands to reason that MLF would entrain more complex micro-biological smells in Pinot Noirs when operating over a six-month, rather than a two-month, period. The opposite of trying to get the wines cleaned up quickly would be to leave a greater amount of lees in the barrels during sur lie aging, and then to perform batonnage (stirring the lees up) frequently. Barrel aging has the potential to make strong contributions to any Pinot Noir’s flavor profile. To the degree Pinot Noir is a delicate wine, the potential of overpowering a wine’s character is a clear and present danger. However, a top-end brand such as Meo-Camuzet in Burgundy, with their four glittering Grand Cru vineyards, has lent credibility to the use of new, high toast barrels for wines which command enormous amounts of money. We can debate whether this is an example of the Emperor’s new clothes. Perhaps more interesting is any attempt to match certain Pinot Noir styles to the flavor components created by various coopers when they use different woods and barrel making techniques.